But in ourselves, that we are underlings. He says he does, being then most flattered. Cry, 'Havoc!' and let slip the dogs of war. I come to bury C—sar, not to praise him. The good is oft interred with their bones. To part the glories of this happy day. This play ought to be called Brutus, since the central theme concerns that character's decision to join an assassination conspiracy and the repercussions of his action. Julius Caesar is dispensed with by the halfway point. However, Caesar's assumption of the Roman dictatorship after the civil war fought against his former triumvirate partner Pompey and his victories in battle celebrated in the first scene of Shakespeare's play make him the most famous historical character of this period. In the play, the republican conspirators fear he will also allow himself to be crowned king. This fear may seem strange to us, since Caesar already had supreme power, but a kingship would usher in imperial power with an hereditary leadership, as opposed to the existing system in which the nobility chose who would rule. You can see that political terms such as "republican" had a slightly different meaning in those days. But if Brutus, Cassius and the gang killed Caesar to remove a tyrant and to preserve what they considered democracy, then why are they the bad guys in Julius Caesar? 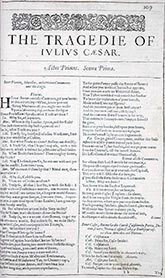 The plot of the play, like the storylines for Shakespeare's other Roman tragedies, was taken from Plutarch's Parallel Lives, written over a hundred years after the assassination, during the height of the imperial power in Rome that did indeed succeed the republic—at a time when Caesar and his heirs were greatly admired. Also Shakespeare was writing in England during another greatly admired British monarchy, Queen Elizabeth I, whose aging was giving rise to fears about battles over succession. Sometimes, it seems the only thing Shakespeare considered worse than a bad ruler was the killing of a bad ruler. All in all, Julius Caesar is morally a somewhat confusing play. Which may be Shakespeare's point: morality is a shifting battlefield. It is often said this is a play about loyalty, but even this virtue is not an absolute, for loyalties also clash in Julius Caesar without providing a guide through the contradictions. Loyalty to leaders versus loyalty to the people. Loyalty to family versus loyalty to political ideals. Loyalty to competing friends and lovers. With the ethical morass into which the protagonists fall, the play is a precursor to Macbeth, but in that later drama the confusion of fair and foul is eventually put right. The protagonist Macbeth is also a more typical Shakespearean tragic figure in that a fatal flaw—overweening ambition—brings him down. Brutus has no such driving character flaw. His downfall comes about because he didn't have Antony killed when he could have and because he trusted others. He'd make a good study for one of those modern pop-psychology books with titles like Why Good People Do Stupid Things. "Beware the ides of March"
"Cry 'Havoc!' and let slip the dogs of war"
"Not that I lov'd Caesar less, but that I lov'd Rome more"
"Friends, Romans, countrymen, lend me your ears"
"I come to bury Caesar, not to praise him"
"The fault, dear Brutus, is not in our stars, But in ourselves"
"There is a tide in the affairs of men Which, taken at the flood, leads on to fortune"
"The evil that men do lives after them; The good is oft interred with their bones"
For me, this is Shakespeare's ultimate message in Julius Caesar. However, confused and contradictory is human nature, it is what we are and overall it is a wondrous thing. For all his terrible mistakes, Brutus is someone we can look up to as an epitome of humanity. Don't worry, Antony gets his deserts in the sequel, Antony and Cleopatra. © Copyright 1999–2017 EditorEric.com. All rights reserved.